FREEZE! It’s the tram police. An army of tram inspectors will patrol carriages and quell anti-social behaviour when the transport network finally launches on Edinburgh’s streets, the News can reveal. Conductors will check tickets, maintain order and ensure passenger safety along the tram line, which is on track to go live some time before Christmas. It is understood that while light rail networks in Dublin employ on-board security teams to police expected periods of rowdiness – such as late-night at weekends and on St Patrick’s Day – the Capital will rely on tram inspectors to police its carriage rules. Once operational, tickets to journey along the Edinburgh Airport to York Place route will be on sale online or at one of the 48 automated kiosks dotted along the 16-stop line. Inspectors will not be equipped to accept ticket payments – like in Sheffield – but will be charged with performing a range of duties including validating tickets and ensuring that travellers behave correctly. They’ll also enforce a booze ban, keep their eyes peeled for fare dodgers and enforce a raft of by-laws covering everything from the playing of music too loudly to wearing offensive clothing with punitive £1000 fines and year-long bans. finding visit to Dublin, said inspectors will be visible. “We will have inspectors to make sure people have tickets and, like Dublin, they will be on the trams all day and into the night. Tram guards on Dublin’s Luas system dress in black clothing and wear stab-proof vests. All carry walkie-talkies to communicate with each other but they are not present on board all trams. Many have police or military backgrounds. Their introduction has led to a major decrease in criminal activity aboard trams. TRAMS will run from dawn until dusk at least every ten minutes, it is understood. Commuters will be able to catch trams from 6am, with the last trains expected to run until midnight. Transport chiefs are expected to announce the launch date for the trams in September. 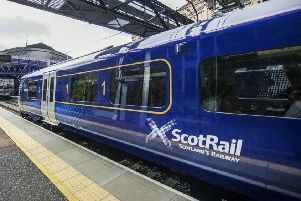 Rumours have circulated that they could be available to passengers as early as December but the council has not yet diverted from a 2014 launch. Timetables will be flexible, however, with major events such as Hogmanay ­possibly seeing trams running late into the night. Simon Johnston, editor of Tramways and Urban Transit magazine, said Edinburgh’s expected timetable chimed with other trams Europe. “This will cater to the whole population – from early-morning commuters to restaurant and bar workers who finish late at night,” he said.